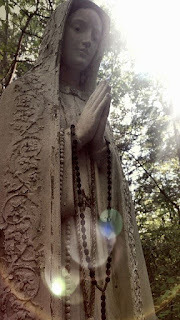 Although obviously Marian in character, the Rosary is Christ-centered in its essentials. It is a meditation on the lives of both our Lord and the Virgin Mary. Christian prayer tries above all to meditate on the mysteries of Christ, as in the Rosary. For an increase in the virtues of faith, hope, and charity. As it was in the beginning, is now and every shall be, world without end. Amen.Now begin the mysteries of the day. Start each decade by announcing the mystery and directing your imagination and attention towards that particular episode in the life of Christ or our Lady. It can be useful to follow the announcement of the mystery with the reading of a related scripture passage. Then proceed to the recitation of the decade. On the large bead, say the Our Father. On each of the ten small beads, say a Hail Mary. Then pray the Glory Be. It is customary in many places to end each decade with the following prayer given to us by our Lady at Fatima. O my Jesus, forgive us our sins, save us from the fire of hell, lead all souls to heaven, especially those in most need of Thy mercy. Hail, holy Queen, mother of mercy, our life, our sweetness, and our hope. To thee do we cry, poor, banished children of Eve. To thee do we send up our sighs, mourning and weeping in this valley of tears. Turn then, most gracious advocate, thine eyes of mercy towards us; after this, our exile, show unto us the blessed fruit of thy womb, Jesus. O clement, O loving, O sweet Virgin Mary.